Cloudflare has a lot of built-in one-click security and impovement options for all kind of websites, including WordPress websites. But what if we want to create some custom WordPress-specific rules? – Usually such things are done by WordPress Security plugins. But i have always been against using a lot of plugins. Less plugins, less trouble. If you are using Cloudflare for your WordPress website – then it presents in all requests of your traffic – that’s why it can’t be compared with using WP Plugins. That’s why it is better to use some Cloudflare functions and remove plugins doing the same thing at WP side. Just replace 11.11.11.11 with your static or VPN IP and that’s all. 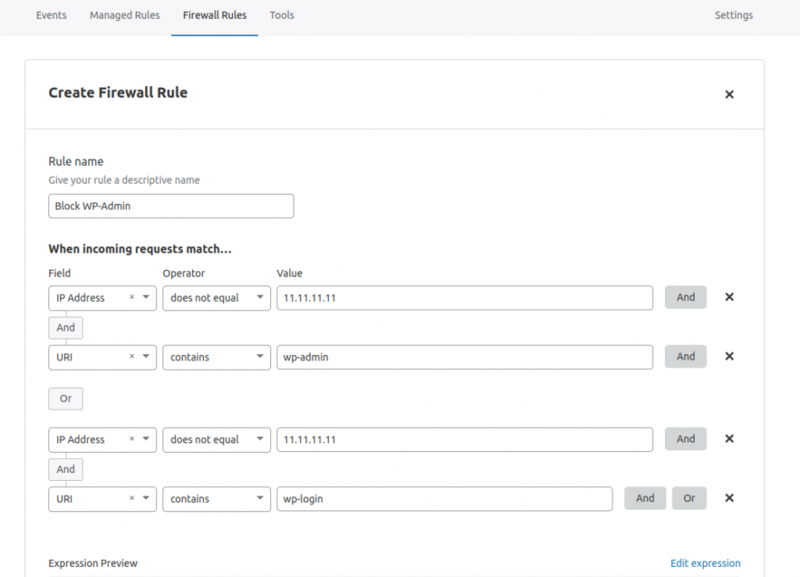 By using Firewall Rules and Custom Page Rules you can build really effective and trustful functions for your website traffic. And both rules sections are available in Free plan.